Imagine you could harness, at will, the mind-body connection responsible for the heightened mental states giving rise to creative genius, inspiration, bliss, mystical experiences, and possibly even enlightenment? You may have noticed how sciences such as biology, physics, medicine, and even theology increasingly overlap, with energy and consciousness at the center. Energy medicine is revolutionizing our approach to health, as science gives us ever-increasing evidence for the inseparability of mind and body. But what is this thing called “energy”? You may accept that it exists—even welcome assistance by various energy healers from disciplines such as acupuncture, Qigong, EFT, Jin Shin Jyutsu and others. But do you understand exactly what they’re doing or how it works? If someone asked you to describe this energy, you might struggle to come up with a definition. It’s not easy to wrap our heads around things we cannot see, hear or touch, and it’s even more challenging for scientists to quantify it. An ancient concept called “Kundalini” provides us with a framework for understanding this nebulous idea, and Kundalini Yoga gives us a way to work with it. This article is Part 1 in a two-part series about Kundalini as an intelligent life force, and Kundalini Yoga as the practice that can help it awaken. Kundalini Yoga is the most comprehensive of yogatraditions. The primary objective is to awaken the full potential in each of us. Kundalini Yoga helps us to cultivate inner stillness so we can truly listen, expand our awareness and achieve excellence in all that we do. Kundalini Yoga blends meditation and ancient mantras with physical exercises (asanas), hand positions (mudras), breathing techniques (pranayama), and sound (naad). All of these are merged into carefully choreographed exercises called kriyas that open up energy flow in the body, channeling it in a way that begins stripping away the veils of consciousness. This type of yoga balances and purifies all of the systems of the body, while at the same time calming and sharpening the mind. Kundalini Yoga should not be taken lightly. One teacher describes it as “an express train that shakes us up and wakes us up.” The significance of this cannot be appreciated without some understanding of the nature of Kundalini. Prana is the Sanskrit word for “life force,” the intelligent energy that permeates all living things—and in fact everything in the cosmos. Just like we cannot see protons and electrons, we cannot see prana, although some can feel it shifting and moving through their bodies. The human body has a mechanism by which an enhanced flow of prana reaches the brain via the nerves in and around the spinal column, and this mechanism is called “Kundalini.” Kundalini can be thought of as an intelligent live force channeling prana around the body’s intricate network of energy highways. The chakras are part of this energy system and are described as energy centers, or transducers, that exchange prana between the physical body and the environment. Each of the seven major chakras is said to mediate a different level of consciousness with the outer world. Kundalini is described in the Upanishads, dating back to the fifth century B.C., although the oral tradition dates back even further. Kundalini is known in many cultures, including Tibetan, Indian, Sumerian, Chinese, Irish, Aztec, and Greek. 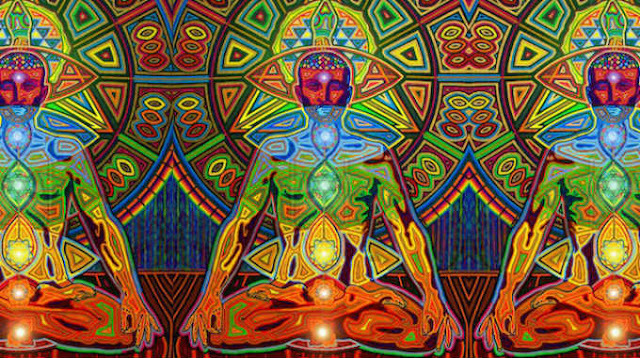 Kundalini can open the doors of perception to vast realms of consciousness and is at the heart of all spiritual experiences. It also explains the wisdom of the sages. It can be enhanced to improve health, awaken creativity, and achieve inspiration. The primary goal of Kundalini Yoga is to “awaken” (or activate) Kundalini, meaning increase the amount of prana flowing to your brain. Under the right conditions, this enhanced prana can lead to higher states of consciousness such as genius, psychic abilities and mystical experiences—and at it’s highest level, enlightenment (Shaktipat). The goal of Kundalini Yoga is to awaken Kundalini and help you learn how to modulate it, i.e., turn it up or down at will. If Kundalini awakens too quickly, such as through very intensive meditation or yoga practice, an individual may experience spontaneous Kundalini “episodes,” which can be emotionally challenging and even manifest as what might be mistakenly diagnosed as “mental illness.” This results from heightened brain and nervous system sensitivity. If you begin a Kundalini Yoga practice, it’s important to proceed slowly, being mindful of any uncomfortable feelings or mental states that may arise. Many physical symptoms and illnesses are manifestations of disrupted energy flow in the body. When done correctly, Kundalini Yoga is powerful medicine capable of producing widespread healing of both physical and emotional issues. This post was republished from greenmedinfo.com. You can find the original post here. She is a Wild Card, the Omega Female. You Don’t Need A Man, You Need a Goddamn Warrior.